Welcome to the 2nd International Symposium on Secure Virtual Infrastructures (DOA-SVI 2012), held in Rome, Italy, September 2012. This conference extends and incorporates the 14th International Symposium on Distributed Objects, Middleware and Applications and 7th International Symposium on Information Security. Distributed computing is undergoing a radical paradigm shift, with cloud computing and service orientation enabling new business models based upon seamless provision of dynamically scalable, virtualized resources as services to be made available over the cloud, to be accessed via a web browser. For this vision to be realised, a number of problems need to be solved, involving the nuts-and-bolts of virtualization as well as the reliability, scalability, privacy, security and transparency of cloud computing. This conference provides a forum for discussion of these topics, and linkage between these potentially diverse areas. All submitted papers passed through a rigorous selection process. In the end, we decided to accept 9 regular papers from the original 25 submissions. Putting together a conference like DOA-SVI is always a team effort, and many different contributions need to be acknowledged. First of all we would like to gratefully acknowledge the work of all of the authors, whether or not their paper was accepted, and thank them for choosing DOA-SVI to present their research work. Secondly, we are grateful to the dedicated work of the leading experts in the field from all over the world who served on the Program Committee and whose names appear in the proceedings, and would like to thank them for helping us put together an excellent program. Thirdly, we would like to thank our keynote speaker Volkmar Lotz from SAP. 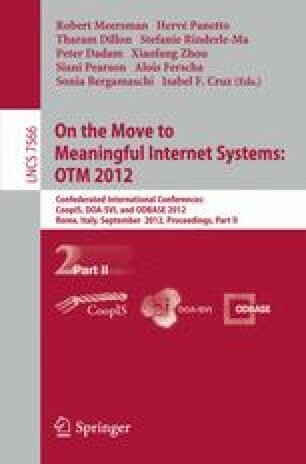 Finally, we would like to thank the whole OTM team for its support and guidance, including the General Co-chairs Tharam Dillon and Robert Meersman, and the OTM Secretariat. The proceedings you hold in your hand are the result of the hard work that everyone has put into DOA-SVI. We hope that you enjoy them.